A year ago Ankali was still just an idea in our heads. Fast forward twelve months and things are beyond exciting. 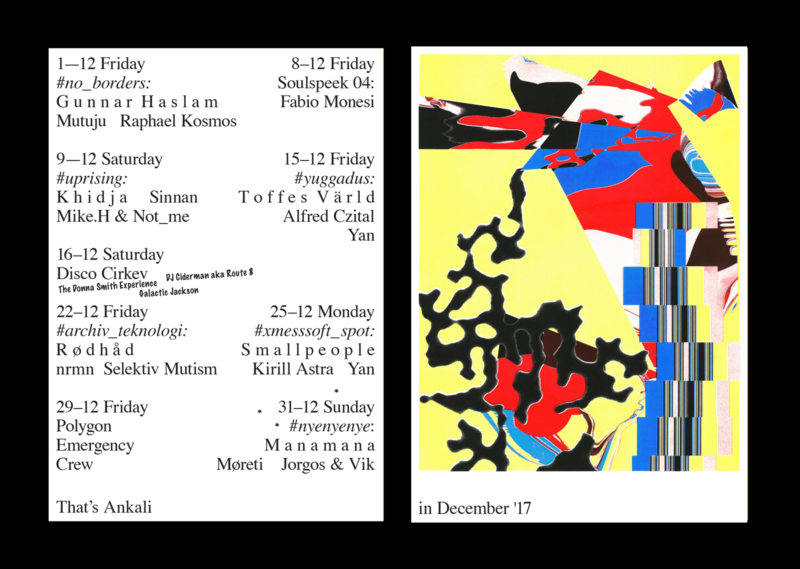 At the turn of the year we invite you to wrap up 2017 and dive into 2018 with Manamanama, Møreti, Jorgos and Vik. Manamana are Sevensol and Map.ache, two friends and djs hailing from the house-stadt of Leipzig. The two also happen to run the fantastic label for modern dance music KANN (along with dj Bender) and given their impeccable taste as label curators as well exceptional record selector, it is no surprise their sonic reach expands gradually. It is also due to their residency at the beloved Nachtdigital festival that they’ve become experts in unhurried sets that take you back to the middle of a warm summer night no matter where you are. Without sacrificing the take-it-easy vibe embodied in their name, the two regularly manipulate most exciting dance floors of the scene incl. Panorama Bar, De School and ://about blank. Ain’t no coincidence that the local head Møreti is also on the bill. A longtime friend of the Mana boys, Møreti introduced the whole Leipzig scene to a local cohort of devoted listener of the then-stagnating local scene a decade ago and it was at his legendary parties Magion, Musikfarben and MUAH! when this sound was slowly becoming ubiquitous in our scene. He also happens to be one of the most unpredictable and exciting djs to dance to, so be ready. Warpping up the line up are Jorgos and Vik in a b2b set. Jorgos is a go-to name when looking for contemporary house & disco at its best and proves his profile weekly in clubs around Prague and beyond. Vik runs the Vinyl Kink shop in Prague and is a veteran of the local house scene and in his flawlessly mixed sets, trippy disco shares the room with finest house and more.